We have another e-book now published in the Facilitation Analytics (TM) series: Navigating With 3D Evaluation: Public Dialogue for Results. This book provides a framework for early, ongoing, and systematic analysis so you can plan, manage, achieve results, and show the value of the process. These books distill our experience into easy to read pragmatic tools to help you plan and facilitate successful dialogues, or as we say, “20 years in 20 minutes”. Our second book “Dealing With Disruptors” looks at how to work with rather than against the emotional energy that participants often bring to public and other dialogue processes. It pairs well with our first e-book in that series, “Understanding the Facilitation Cycle“, published April 7, 2016. ICMA published our e-book, “Civic Engagement: 10 Questions to Shape An Effective Plan” in 2014. In addition to our workbook and e-books, we have developed a number of products that support our training and facilitation services. These products can be purchased for individual use by other trainers and facilitators. We can also license these for use and provide electronic files to organizations for more regular usage. If you are interested in learning more about licensing arrangements, please contact us at info@buildingdialogue.com. All prices include shipping and handling in the United States by First Class Mail. This set of cards helps individuals understand and practice dialogue skills. The cards can be used in training by small groups for a matching exercise, used in a mediation to help people better understand and evaluate communication patterns, and provided to individuals to help them on an ongoing basis to think about what is working and not working in their communications. We have successfully used these cards with a wide range of audiences — everyone from corporate teams to teens at a juvenile justice center. Each purchase of the dialogue cards comes with a summary of dialogue techniques (shown above) and a written procedure for using the cards. 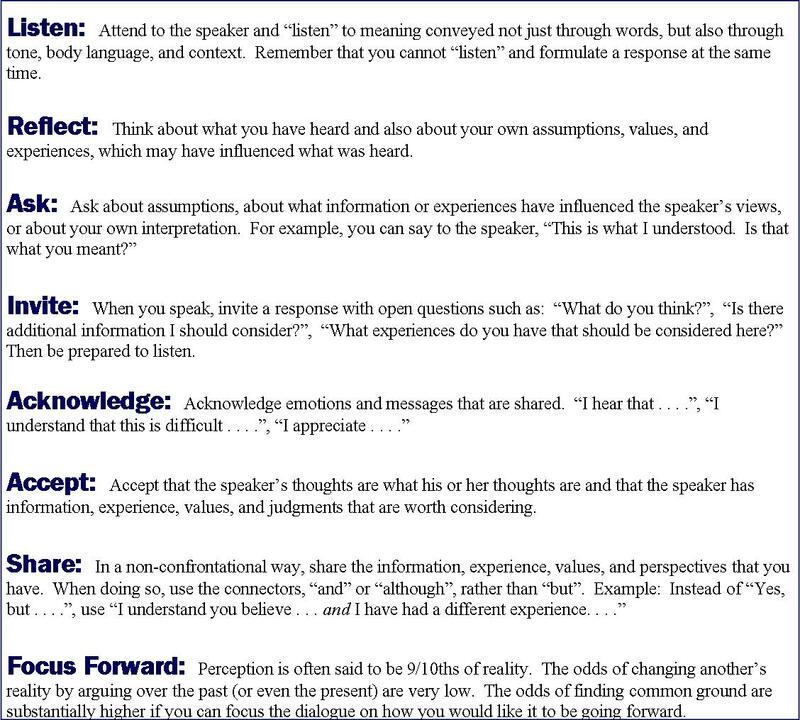 This worksheet tracks the same cognitive errors discussed in this blog series. 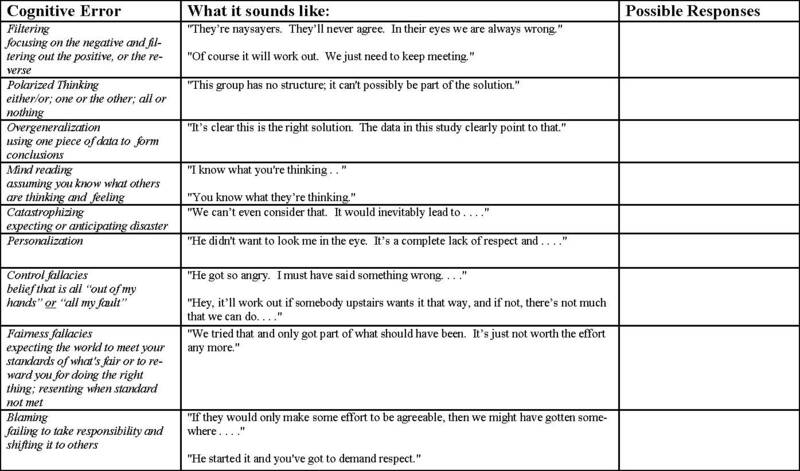 This worksheet can be used in training facilitators or to engage and educate participants before or during difficult dialogues. This tracks the same cognitive errors discussed in this blog series. The examples in this worksheet have been adapted for use in trainings for teachers or teens. “Conflict Resolution in a Box” Originally designed for trainings, this bookmark has become one of our most useful tools. We use it for anything from quick introductions to the basic principles of conflict resolution to coaching in mediation or facilitation sessions. Once participants understand the graphics, it becomes an easy diagnostic tool that can be used by facilitators and participants to identify “the sticking places” in a difficult dialogue, and “unpack” the conversation so that it can move forward. Learn more about these tools by reading our posts on the 3 levels of Discussion, the Sources of Conflict, and the 5 levels of Resolution. Sold in packs of 10, and the set comes with a one page explanation of its many uses. Our trainings frequently include “food for thought” slides that set forth a quote which highlights a particular point. We then include these quotes on “bookmarks” that clients take at the end of a session. Our clients have told us that these are easy to keep on hand and that they help with ongoing learning. These bookmarks, sold in individual or mixed packs of 10, can be customized with your name and address on the back for an additional cost of $10. Please contact us for this option. We can teach you the techniques you need to to prepare for, work through, and follow up on difficult dialogues. Contact us today for a free quote.